Pool gates opened at 6 pm. People found lounge chairs or put their floaties in the water. 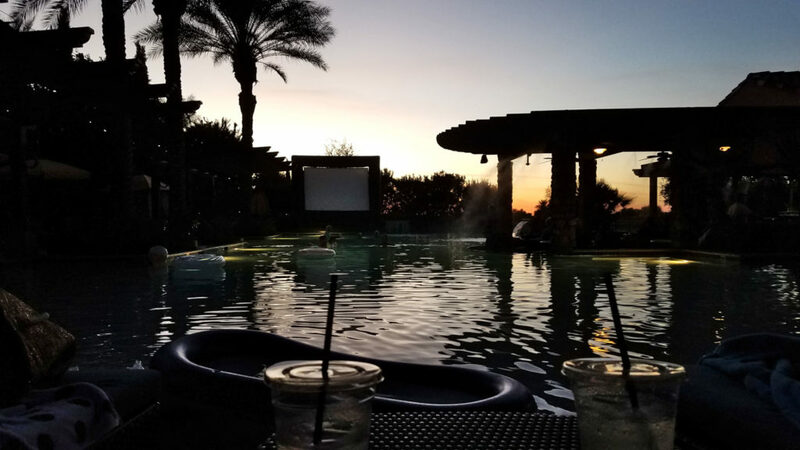 The movie screen was set up at one end of the pool, allowing for maximum use of the pool area for floaters. They used the pool system speakers, so it was easy to hear from any location. Everyone was ready for the 1980s sci-fi classic that started after the sunset. 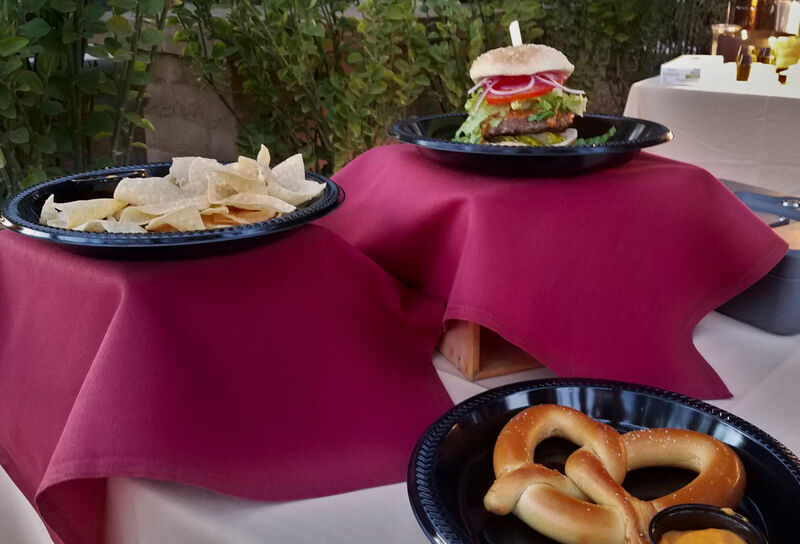 The concession stand was open with refreshments such as Pretzel and Cheese Sauce, Chips and Cheese Sauce, Frozen Snickers, Ice Cream Novelty and the McFly Burger. The hamburger had a cute name based on the movie theme. It was made with cheddar cheese, bread and butter pickles, shredded lettuce, red onion, and of course McFly sauce. 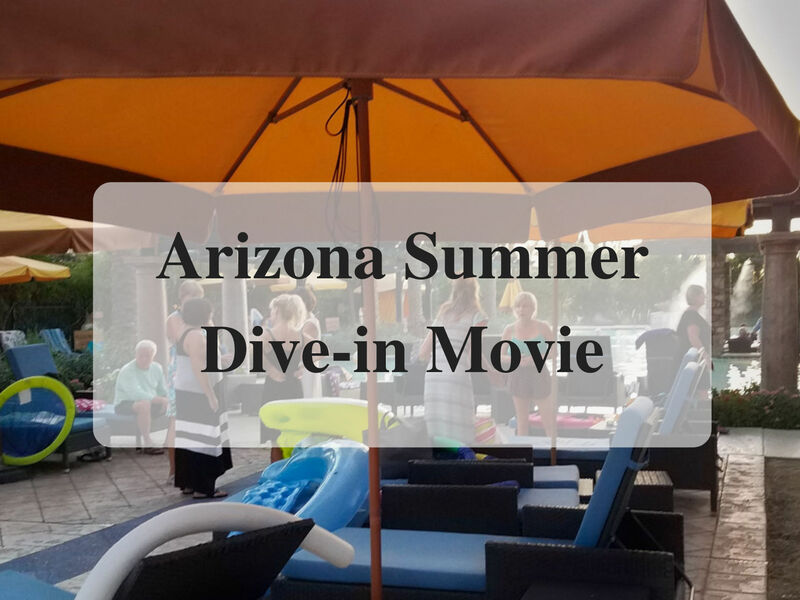 Bring your suit, towel, pool floats, then sit back and enjoy the movie! Seating around the pool was available if you did not wish to go in the pool. 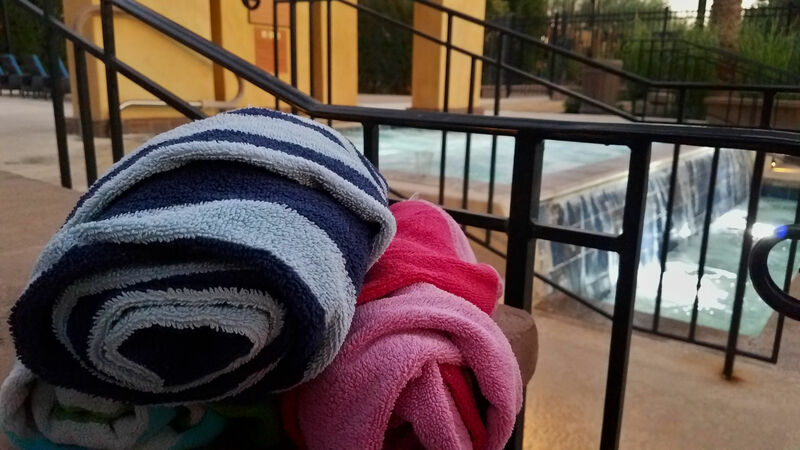 We found ourselves starting in the pool and then sitting in the hot tub because the jets felt great on our backs. 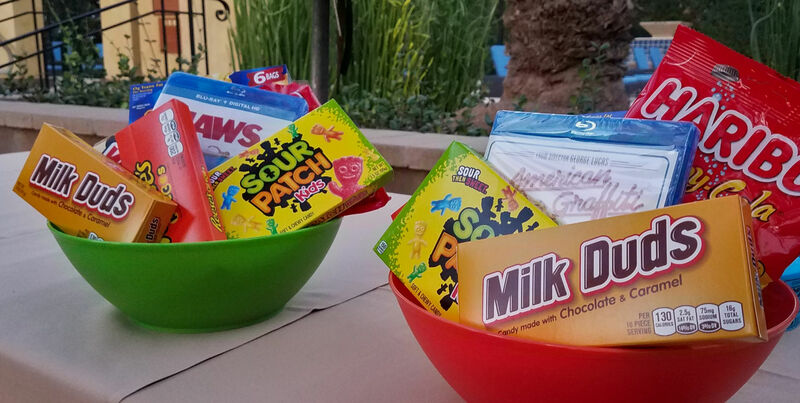 There were movie-themed prizes. The facility handed out raffle tickets when you entered the pool. Before the movie started, they read off the winning ticket numbers, so people would have the snacks in time for the movie. Have you attended a Dive in Movie? If yes, what was it? I loved going to drive in when i was little. I miss them. A “dive in” would be a blast!! Tha ks for sharing! Fun! I love that they had concessions and prizes. We’ve done a few of these while on vacation and it’s such a great twist on movie night. How fun! I wonder if they have these in Texas. I know some of the HOA communities will do them, but obviously not open to the public. Dive in! At first I thought you had a typo, but no! This is such a cool idea. Love it! It’s been years since I’ve done a dive in – and even then it was at a friend’s house – but it was so much fun! I found the whole night to be really relaxing. I agree, relaxing at a pool watching a great move is awesome. Brings back sooo many memories. Tks for the update of ideas. We sometimes have these at our neighborhood pool and the kids always have a great time! That is great. Love that the community puts these events together. I remember going to the drive in all the time when I was younger. Thankfully there are still a couple open around me!